Historically speaking the land has had a predominant influence over the architecture of a given culture. Availability of building materials as well as climate dictated designs. Landforms and other natural elements often influenced designs because of the advantages they gave for defending land, cultivating land, as well as often having religious connotations. However, because of technological advances we don’t have to worry about many of these issues in the developed world. 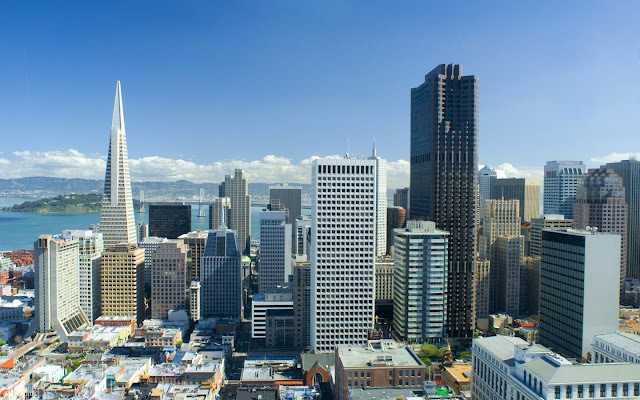 Defense and agriculture aren’t major issues influencing the design of our buildings anymore, and even fundamental problems such as weather and climate aren’t addressed today as they were in the past because of technological advances in air conditioning, heating and other forms of climate control. Still, contemporary architects need to draw on something as inspiration for their designs and often they turn back to the landscape. Before beginning his designs, Predock constructs large collages that conjure up images relating to the site and explore connections to local history and geography. Often his designs take on forms that are clearly inspired by features of the surrounding landscape - such as mountain ranges in the distance, the Pacific Ocean, forests, streams, the desert or other natural phenomena that surround his sites. For Predock, landscape is not something just to gaze upon. It is a great deal more than simply a collection of views. His collages consist of photographs, postcards, rocks, plants, animal skeletons – anything found on or around the site that conjures the spirit of the place. He believes that each site is timeless. Everything from the past and present, from folklore to contemporary technology is included as possible influences on the forms his designs may take. Four projects demonstrate how Antoine Predock has taken different approaches as he works in varying Landscapes. 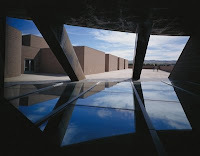 The American Heritage Center in Laramie, Wyoming responds to the large flat valleys and distant mountains. The Ventana Vista Elementary School in Tucson, Arizona demonstrates Predock’s response to the American dessert. The Turtle Creek House outside of Dallas, Texas shows his response to the deep south and how he incorporates his buildings into woodlands and streams. And finally the Venice House outside of Los Angeles, California demonstrates the relationship between his building, the nearby ocean and the surrounding urban context. These four projects all have vastly different climates and terrains. Antoine Predock successfully drew from the surroundings to create responsive designs to all four unique landscapes. This design is viewed by Predock as an “archival mountain with a village at its foot.” The building’s axis lines up with the two highest visible mountain peaks - Medicine Bow Peak, in the Snowy range, and Pilot’s Knob, part of the Laramie range. This axis marks an historical rendezvous point for Native Americans as well as a for French trappers and early American settlers. Now it has become a place of intellectual and social rendezvous. Whenever Predock designs, he addresses the larger natural and mythic context and content of a site and program. A web of site-specific alignments anchors the building into the campus and the immediate landscape. 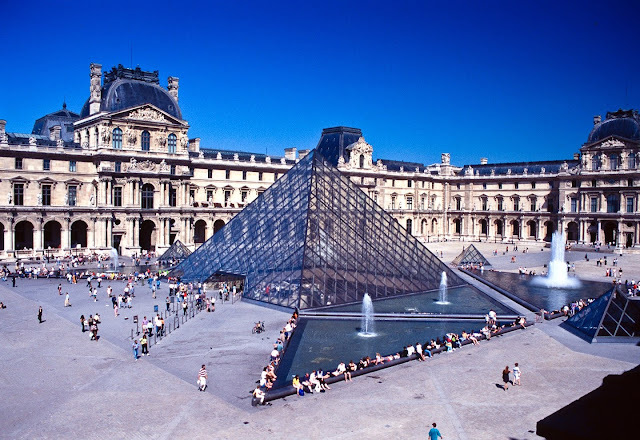 The complex consists of a main building in the shape of a large cone with block like surrounding buildings. This become an abstract representation of a mountain with a small village at its base. The buildings at the base are long terraced flat roof buildings. These structures are meant to recall the architecture of the pueblo Indians. The cone is a mountain, standing alone in a sweeping vista framed in the distance by two mountain ranges. Like ancient temples this structure contains a symbolic significance in its form and orientation. Predock always weds the symbolic forms of his buildings with the practical and useable aspect of design. This site is in the center of a wide valley between two mountain ranges that channels wind. To protects his building from these wind forces he designed the block buildings as long and low structures that are protected by the cone and a wall of trees. The cone itself is detailed like an airplane wing to be aerodynamic. Openings in the cone are kept as small, deep and limited. The top of the cone is an observation deck and a chimney - releasing smoke from the giant hearth that makes up the central shaft of the cone. From a distance the place looks like a strange volcano spewing smoke into the night sky. 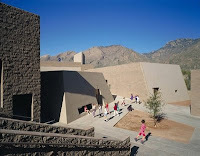 Located near the Catalina Mountains and the Sonoran desert, the School consists of small courts and pathways that are arranged around the two-story library building. The skyline of this school is designed to have a clear reference to that of the mountain range behind it. This "city for children" suggests ageless ruins, thought of by Predock as a direct confrontation with the inhospitable environment of the southwest desert. There is a tent-like white canvas structure that makes reference to the nomadic occupation of the desert. 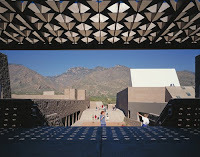 A “Solstice Wall” contains openings of various angles and shapes allowing sunlight to penetrate it on specific days – such as Cinco de Mayo or the Winter Solstice. As light pours through, it highlights plaques embedded in the ground that make reference to historical events. This feature of the architecture allows students to be constantly aware of the passing of time and the sun becomes a teaching tool. These features are a direct result of the influence on the social history of the site as well as the specific environmental conditions. The apertures also frame specific views of the landscape making the wall both an observatory and a beacon. The actual classrooms and activity rooms are all separate buildings. Each building has its own function. There is a structure for each grade level and two large buildings which house the library - in the center of the site - and the Activities center - with the canvas tent covering it. The courts and paths created by the voids between these structures become one of the most significant parts of this design. Each open space focuses on a different form of discovery. They each focus on important learning activities such as vegetable gardens or places for animals. Unique and fun design features are introduced - spy holes into classrooms, the Solstice Wall - and create distinct geographic identities for these open spaces. They also allow the desert landscape to be incorporated into the complex. In one of the highest classrooms there is a mirror against the top of a wall oriented at a 45-degree angle that acts as a periscope and reveals a panoramic view of the nearby mountain peaks. Another feature that connects the building and the landscape is the walls of the fourth and fifth grade classrooms. These walls are made up of large glass garage doors that can be rolled up and allow the courtyard and the classrooms to become one large interior/exterior social/teaching space. Here the concepts of indoors and outdoors, building and landscape are blurred to the point that the landscape and architecture become one and the same. The second and third grade courtyard revolves around the “Sorcerer’s Terrace,” which covers a space for reading. This space is referred to as the desert Kaleidoscope. Covering the area is a shallow dome with desert specific cultural artifacts cast inside a series of acrylic skylights. By gazing through these from below or walking over them from above the young students encounter a spectrum of desert images. 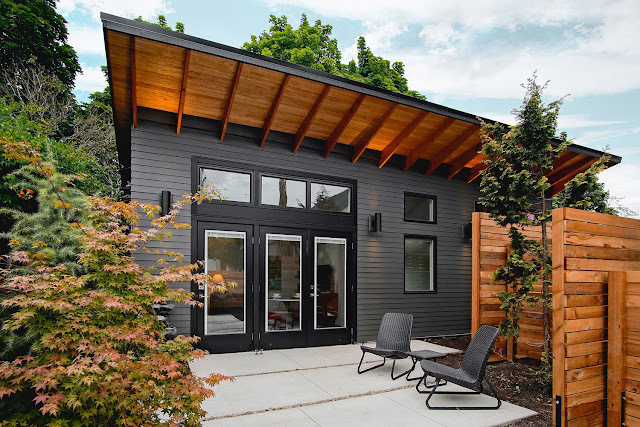 This House - a “theater of the trees” - was a response to the client’s passion for bird watching. The site is at the convergence of two major continental bird flyways. Two distinct facades relate the house to the surrounding landscape in contrasting ways. The first facade confronts the main approach to the house. It consists of large planted limestone block terraces that ground the structure into the landscape. The ledges suggest geologic parallels to the Austin Chalk Formation that runs north south through Dallas. Thus the view from the street is a solid mass of concrete stucco and these terraces. The cave-like entranceway cuts through the terraces to the main house. The ledges are filled with local vegetation that attract birds to the site. When arriving at the site the birds are there, waiting to greet the visitor. The second facade is more open to the surrounding woodlands and overlooks Turtle Creek. It is made up of huge glass windows that allow the surrounding landscape become a part of the interior. Viewed from the outdoors the highly reflecting glass and steel brings the landscape onto the exterior of the house. A giant mirrored steel plate on the front elevation is angled perfectly so that a nearby tree becomes part of the main façade. 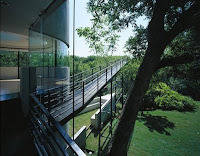 The interior consists of open, sharply angled, bright spaces with huge glass walls overlooking Turtle Creek. Thin metal columns with glass spanning between them, hold the solid walls 6 inches off the floor to create the appearance they are floating. This makes the house seem light and airy. The entranceway that cuts through the limestone terraces opens into a large room that separates the house into two wings. From this room there are ramps, stairs and bridges that cause a processional movement into the rest of the house. 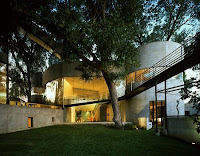 A central “sky ramp” projects out of the entry room into the surrounding canopy of trees. This bridge gently slopes upwards toward the sky. It touches the ground lightly with a steel support system, allowing the terrain to naturally flow beneath it. This ramp is meant to act a physical and spiritual link to the bird’s natural habitat. It leads the viewer into the foliage at the treetops where many birds build their nests. Joining the habitat of local animals with that of humans brings together the natural landscape and the built one. The site contains three strong natural formations that influenced the design. The landscape here is a place where woodlands, prairie and stream overlap. Also the location is a unique place where eastern and western bird habitats converge, and it is located along the north south migratory paths. This site is an ideal place for observation and participation in this ritualistic procession of birds. The rooftop is covered with broad walkways and open terraces that provide ideal and picturesque views of the surrounding woodlands and the stream that flows near the house. Predock also incorporated a circular rooftop “arena” built as an interior room that becomes an observation area for the exterior world. This house examines the relationship between land and water. It focuses the inhabitants on the ocean by setting up a series of vantage points that varying glimpses of the sea. The site is very long and narrow, 30 ft by 90 ft and was a strong contrast to the nearby ocean, which is a vast open space with dramatic horizon line. Predock dealt with this contrast by creating a plan with a diverging perspective fostering a condition that brings the ocean closer. This view is capped by a massive 9’ x 14’ window, framed in red, which is mounted on a giant pivot. When this pivoting window is open sea breezes permeate the house with the smells and feel of the salty ocean air. Immediately adjacent to the red-framed window is a small triangular area with thick concrete walls where one can stand and gaze through a three quarter by twelve-inch deep fragment of glass cast into the concrete. Through this sliver of glass a kaleidoscopic view of the ocean, the sky, and the sand is revealed. Predock’s idea was to encounter the sea from an “alleyway.” The long site between other houses evoked the feeling of an urban alley. The use of concrete as the main material for the house further enhances this architectural analogy. The rear facade is on a small street consisting mainly of opaque glass with two small terraces that overlooking the street. The garage door is made of a reflective material, which mimics the life of the street. The front façade opens onto a boardwalk that separates the house from the beach. A polished granite wall covered with a film of water at the front of the house creates a symbolic bridge to the nearby ocean. It is a constant fascination for the people passing by on the boardwalk who are able to walk up and touch the smooth waterfall. This wall is the first contact you have with this house. Its material is a recollection of the natural bedrock of the Los Angeles basin and the water brings a physical interaction between the architecture, the people and the vast ocean.